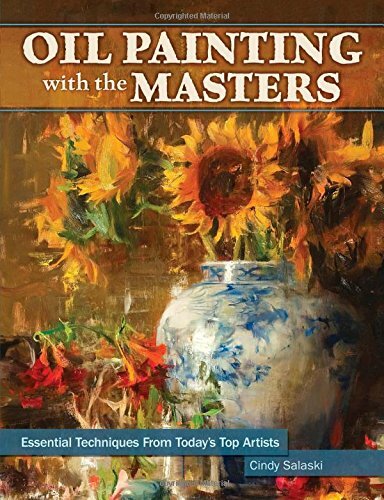 This is an outstanding book that beginners and advanced oil painting artists can enjoy. The paintings featured in the book are really beautiful. I wish I could see them in their actual size. Author and artist Cindy Salaski has done a terrific job at finding the artists featured and curating the artworks. The artists included are Kevin Macpherson, Laurie Kersey, Richard McKinley, Camille Przewodek, Phil Starke, George Gallo, Marc Hanson, Susan Lyon, Jeffrey Watts and Robert Johnson. There are 11 chapters in the book. The first 10 chapters each has an artist profile followed by text on a particular technique and a detailed step-by-step demonstration. The topics deal with the handling of mood & atmosphere, light & form, composition, lost & found edges, brushwork and many other useful fundamental techniques. The writeup is incredibly insightful as the artists share in depth their techniques and tips, and even the specific colours used for each step in their demonstrations. The artists would explain what they are doing and why it's done that way. It's an illuminating look at the painting process from the start to finish. Beginners should be able to learn what those master artists look out for when painting, and advanced paintings will get the insight from observing the painting process from various artists. The last chapter has a gallery that showcases artworks from a few more artists. You can also check out more of their art from the websites provided. Oil Painting with the Masters works well as an instructional book and is a great reference book to refer back to often. It's really an inspiring book. Highly recommended to oil painting artists.